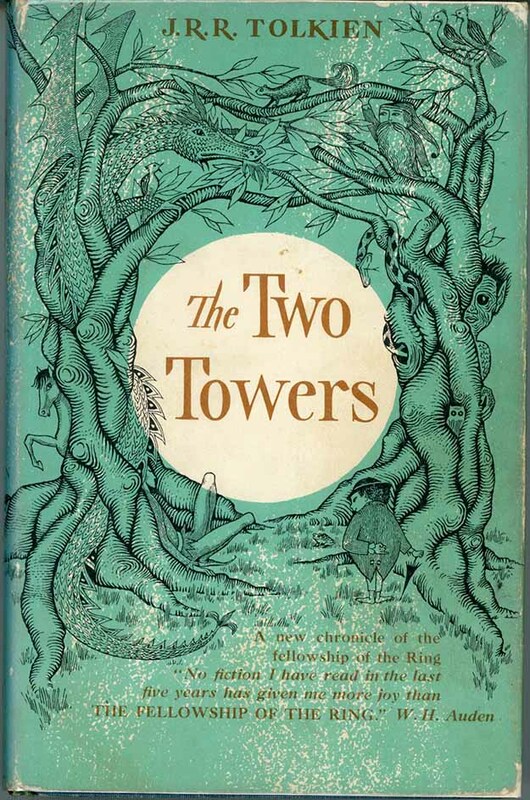 Dust jacket art by Tolkien. I had a good friend in grade school, Mrs. Grady, the school librarian, who knew my interests. One day—I don’t recall the year, but around 1963—she handed me a copy of this book and said she thought I’d enjoy it. I not only enjoyed it, it was smitten! I loved everything about it, from the cover and endpaper maps with their fascinating calligraphy to the story, the characters, the illustrations, and above all, the entire complex world created by the author. Yes, there were some things I’d found in other fantasy works, but much of it was clearly new creation. 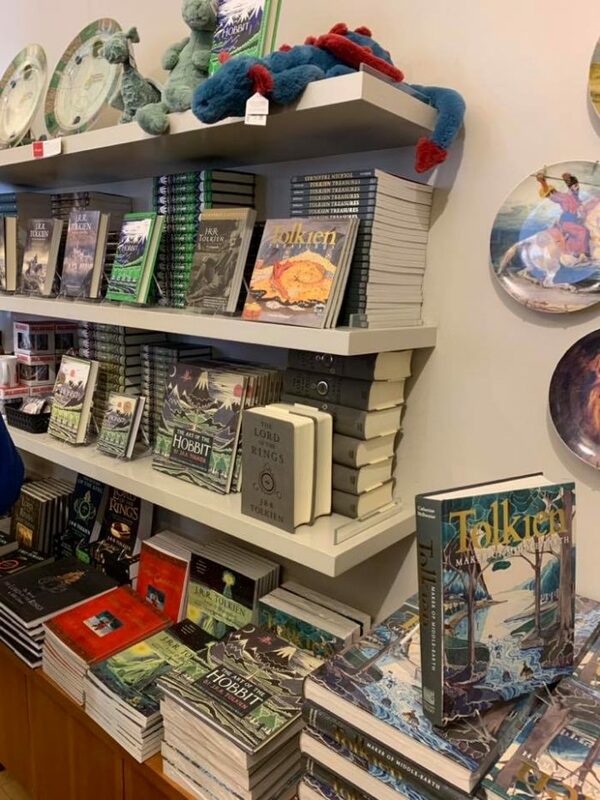 Of course I wanted to read more by Tolkien, and Mrs. Grady told me that a sequel of sorts, but a much longer book in three volumes, had come out in hardcover, but she had not read it or seen it yet. 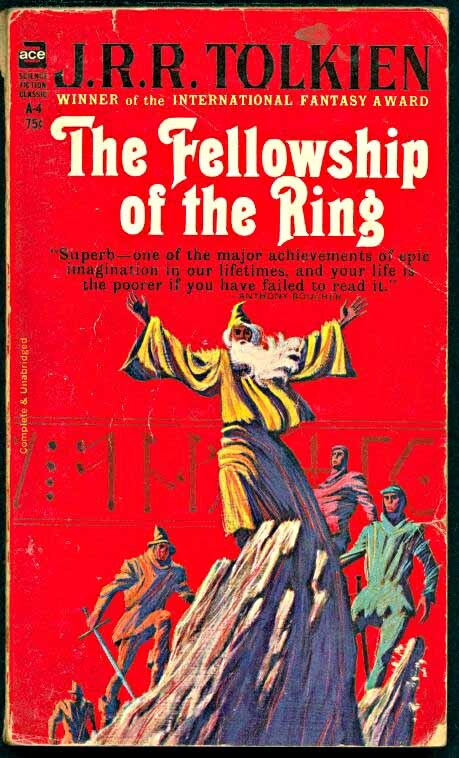 One day in the spring of 1965, in a local bookshop, I found this, the first volume of The Lord of the Rings, Tolkien’s sequel to “The Hobbit.” I bought it eagerly and read it as fast as I could. I can remember going for a drive with my family when I should have been looking at the sights, but instead my attention was deep in the Mines of Moria as Gandalf made a stand against the Balrog. I was devastated by his fall, he was my favorite Tolkien character. I can’t tell you how grateful I was, and that inscription has stayed in my thoughts ever since. And I was so thrilled to learn the true fate of Gandalf in this volume, even though it was becoming a very dark story. A matching hardcover of the third volume—with another fold-out map AND information on the languages and letters Tolkien had created—was bought with my own money made from mowing lawns later that year, and I’ve read and reread “The Lord of the Rings” and “The Hobbit” ever since, not to mention everything else by Tolkien I could find. I did eventually get the updated Ballantine paperbacks, but a larger-size trade paperback edition of the three books in a boxed set. 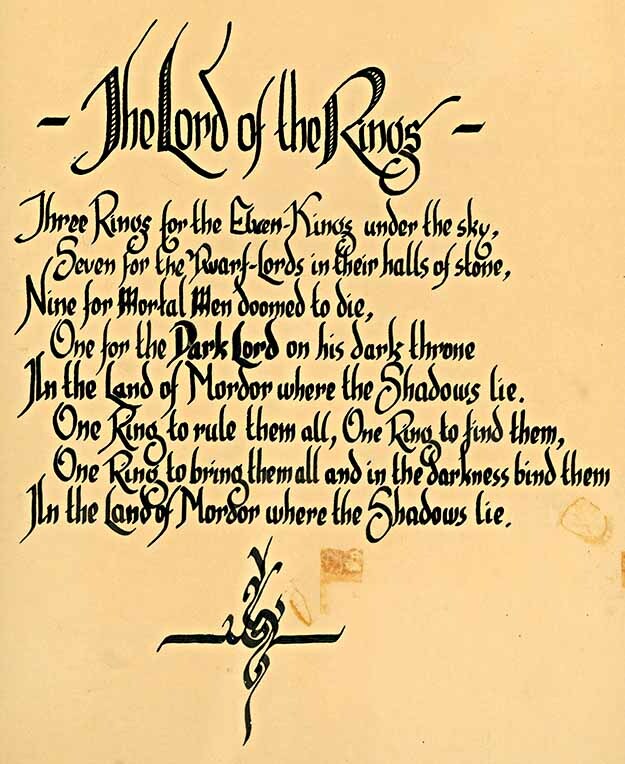 My own interest in calligraphy and lettering had begun with beautiful work of that kind my grandfather Rex Derr did, and Tolkien’s influence fanned the flames. Here’s a version of the ring poem by Tolkien that I did in high school, nothing much compared to the master’s own work, but I was happy with it at the time, and pinned it on my wall alongside the Pauline Baynes poster of Tolkien’s Middle Earth map. In those ancient days of my youth, when forms of entertainment were much fewer, I would often read favorite books aloud to my brothers, a chapter at a time. Doug soon became as much a fan of Tolkien as I was, and we went through the entire Hobbit and LOTR that way. At the time I think he identified with hobbits a lot, and made himself a walking stick and cloak for hiking in the woods near our home. 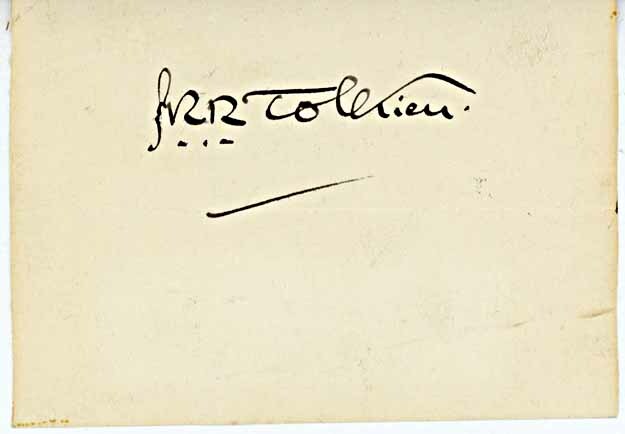 Other short works of Tolkien were soon being published, and there were rumors of another epic that would fill in much of the previous history of Middle Earth. 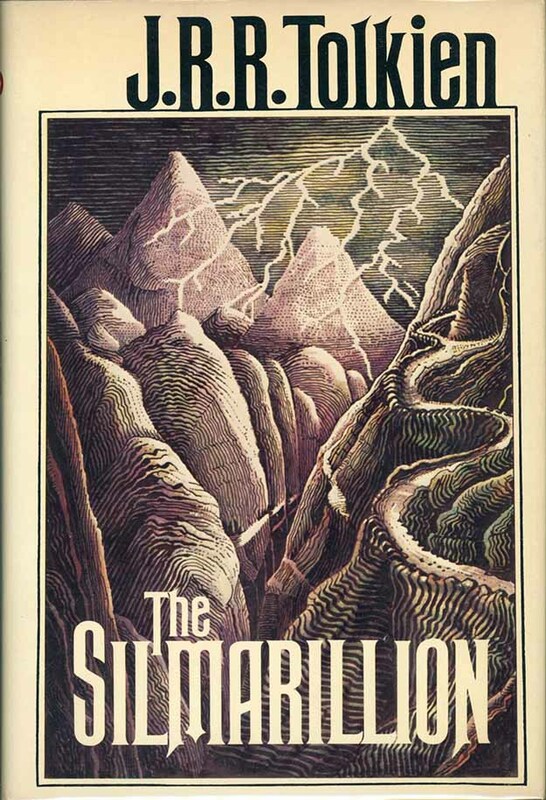 We were very sad to hear of Tolkien’s death in 1973, but very happy to buy and read that prequel, “The Silmarillion” when it was published in 1977. I bought the hardcover immediately, and was once again enthralled by the world-making, though I have to admit I didn’t like this more scholarly book as much as the previous epic. More of Tolkien’s own art gradually surfaced in places like the annual Tolkien calendars, including the color illustrations for “The Hobbit” that had been left out of my later edition. When I was able to get to England myself, the first time in 1979, I made Oxford one of my destinations, and soaked up the atmosphere that Tolkien had enjoyed, including a visit to the pub where his group of literary friends, including C.S. Lewis, another favorite author, had some of their meetings. 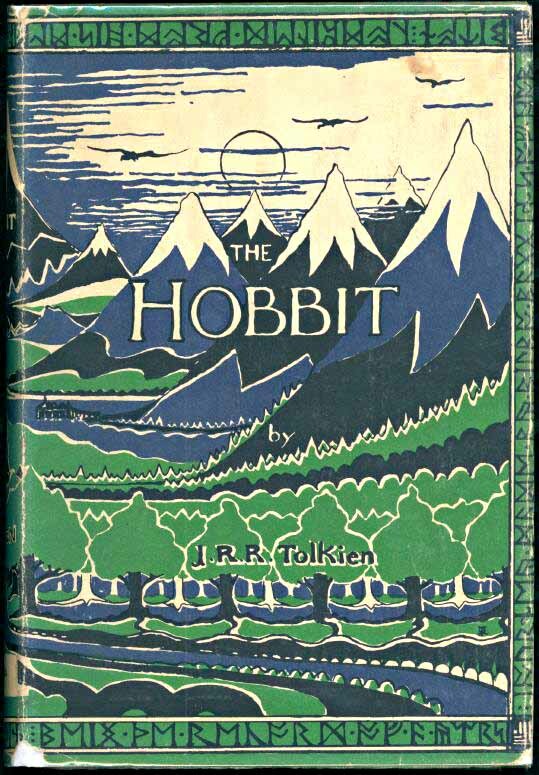 Through the years, Tolkien’s son Christopher continued to add to the Tolkien canon, drawing from the many unfinished versions and works in his father’s papers, and I enjoyed them all, but my favorite thing has always been to reread the Hobbit and LOTR every few years. It’s a world I love to be in, even in its darkest moments. When the Peter Jackson films came out, I was at first skeptical, but came around to liking them very much. His version of “The Hobbit” did not work as well for me, as it became an action film that drifted far from the book. 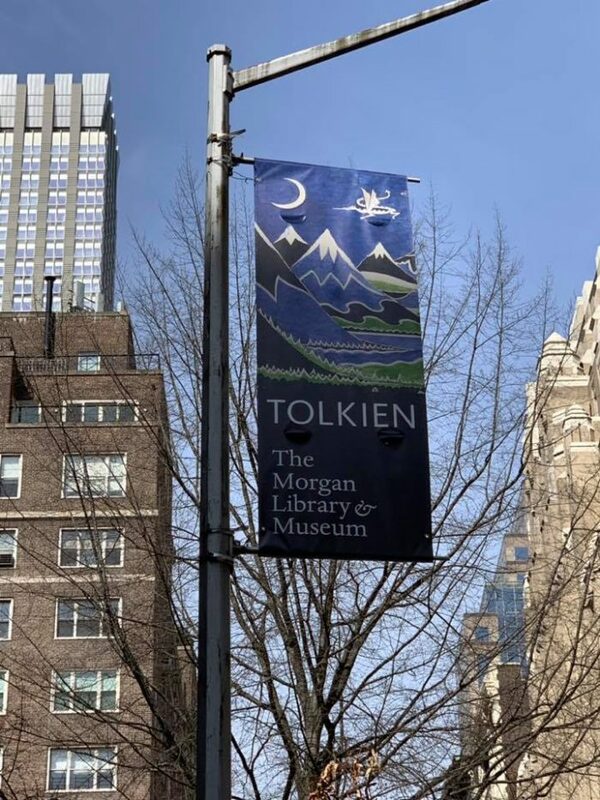 Fast forward to earlier this year when I learned that a major exhibition of Tolkien’s art and other work was coming to New York City’s Morgan Library and Museum. The Morgan is a fine place, I had visited it often when I worked in the city, but hadn’t been there since the late 1980s. I knew I had to see this exhibit, and Ellen and I made plans for a day trip from our south Jersey home. My brother Doug and his friend Vito, another early Tolkien fan, would meet us there. The way we get to New York from our house is to drive to the Park and Ride station in Tom’s River, NJ, already over an hour’s trip, and take the express bus in from there. 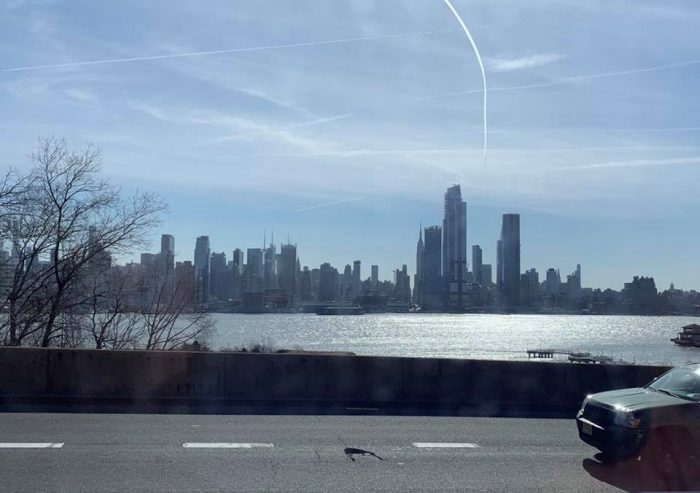 It was a nice day, if a bit cool, and as we entered the Lincoln Tunnel to the city, I got this photo of the Manhattan skyline. We left home at 7:30 and arrived at the Port Authority bus station at about 10:30. Just outside we stopped for a snack at the Carlo’s Bakery shop, which I hadn’t known was there. 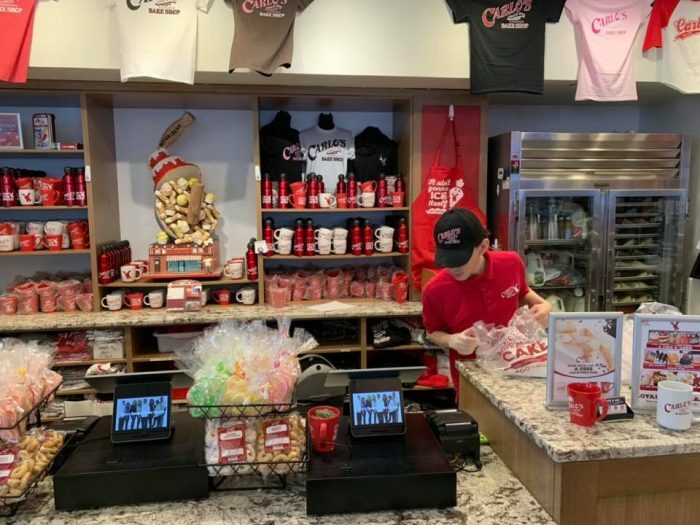 We’ve watched many episodes of the “Cake Boss” TV show about their bakery in Hoboken, NJ, so that was a fun place to visit. 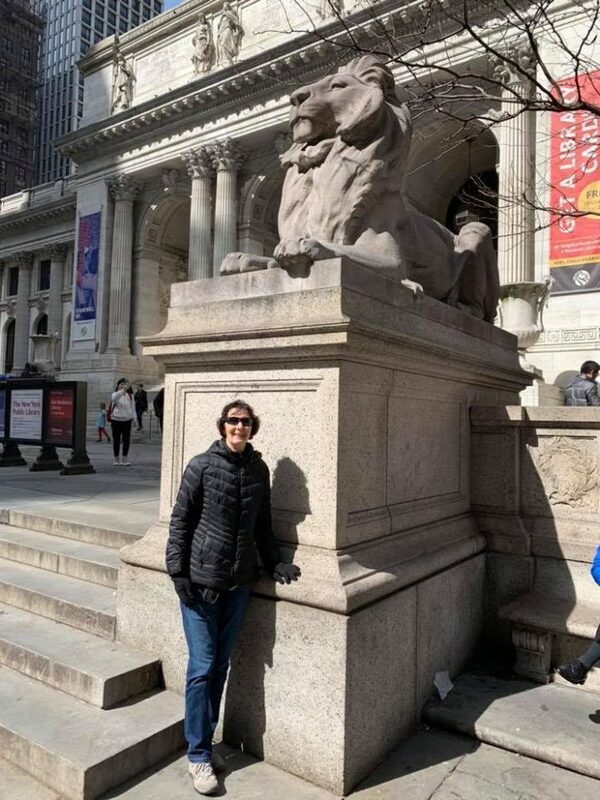 We walked along 42nd Street, through a bit of Bryant Park where daffodils and pansies were blooming, stopping for a photo with one of my favorite lions outside the main branch of the New York Public Library. 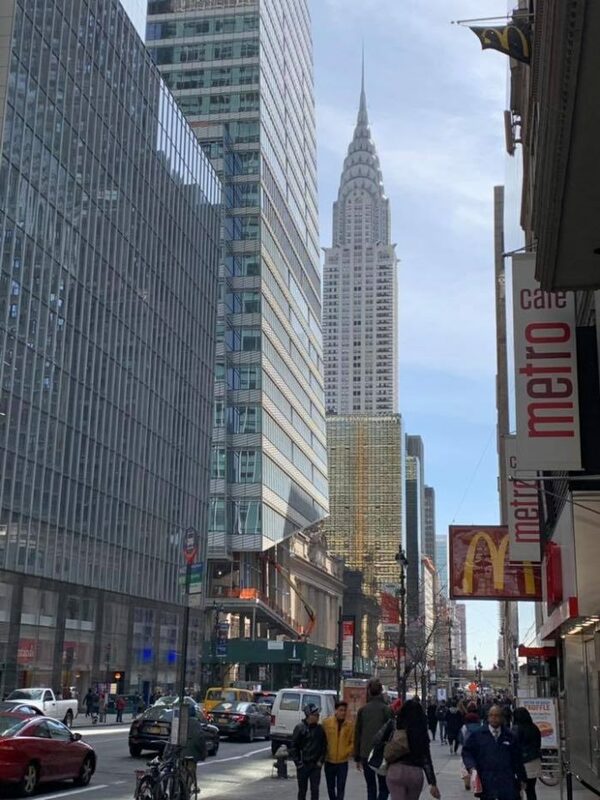 Further along 42nd Street were great views of that largest and most perfect example of Art Deco architecture, the Chrysler Building. Before we reached it, we turned south on Madison Avenue. At 37th Street we came to the Morgan Library and Museum, where banners like this made my heart glad! We walked around the outside of the place first, and noted major renovation work happening on the exteriorof the original building. A new addition on the west side since I was here last is now the entrance to the museum, and has doubled their exhibit space by filling in the area between the original Morgan Library and two other smaller buildings owned by the Morgans, which are also part of the museum now. We met Doug and Vito, and spent over an hour in the exhibit, which was amazing and wonderful! My overwhelming impression of seeing the work in person is how small most of it is. Tolkien did much of his art not much larger than printed size, and we were amazed at the amount of tiny and beautiful detail work he managed to produce that way. No pictures allowed in the exhibit, of course, but the museum gift shop had the exhibit book, at lower right above, which I bought. It has everything in the show and more, and when I’ve had time to read it and enjoy it, I’ll write more about it. Maps, calligraphy, art from the books, and many things I’ve never seen, the show had it all. It was a great experience, and one I will always remember, capped off by a fine lunch at a nearby Irish pub, and then the long trip home. I highly recommend this show to anyone who likes Tolkien, and how could you not, I say. It’s there until May 12th. We did not have to wait to get in, though I know it’s a popular show. I think going on a weekday was a good idea, and probably not waiting until the last days of the show was too. Go if you can! This entry was posted in Books, Remembered, Reviews on March 31, 2019 by Todd.